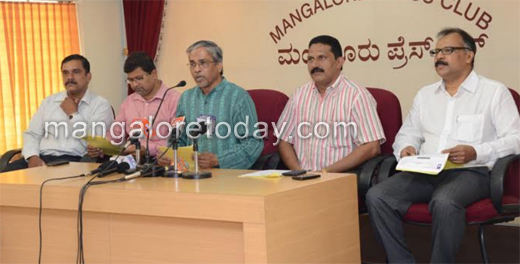 Mangaluru, July 8, 2015 : Addressing media on July 6, Eric Ozario, gurkar, Mandd Sobhann, said that this City a centre for Konkani will host a week-long Konkani filmotsav from July 10. Organised jointly by Mandd Sobhann and Tiatr Academy of Goa, it would feature one of the noted films, Uzvaddu, directed by Kasaragod Chinna, former chairman, Karnataka Konkani Sahitya Acacemy, and theatre artistes on the last day. The film makes an attempt to showcase Konkani Saraswath tradition and culture. Though many Konkani movies were being produced and released in Goa, they were not screened in Mangaluru, except the ones produced in Karnataka. Hence, there was an impression that there were hardly any films made in Konkani. Answering a question he said that six or seven Konkani films are being produced in Goa in a year. Konkani was spread over different countries and spoken by about 40 communities, he said. Ozario said that Prince Jacob, president of the Tiatr Academy of Goa, would inaugurate the festival. He is an eminent theatre artiste and a Konkani film star. Roy Castelino, president, Karnatka Konkani Sahitya Academy, would be present. The director and producer of each film would be felicitated on the day of the screening of their films. The venue of the festival is Bharat Big Cinemas. The entry fee per head per film is Rs. 100. If one wanted to view all the seven films, season ticket would be at a special offer of Rs. 500. He said that the festival will help promote Konkani films in Mangaluru. The konkani’s must watch the movie .It is said to be the best movie.